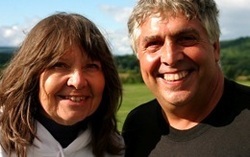 Lee and Betty Sue Robie are the current owners and the fifth generation to work the Robie Farm. Their three sons, Neil, Tim and Mark, daughters-in-law and their four grandchildren make up the sixth and seventh generations. We are also blessed with many generous friends who are always ready to lend a helping hand on the farm all of whom we are proud to number among our family. The current owner, Lee Robie, is the fifth generation of Robies to manage the farm. Lee and his wife, Betty Sue took over the farm in 1987 when Lee’s father retired. After many years of managing all aspects of the farm, from milking a herd of 60 Holstein cows to mending fences, Lee has evolved his role on the farm to sales/marketing manager in alliance with Upper Valley Produce, a major supplier of produce, meat and dairy for restaurants and retailers in New Hampshire and Vermont. Through networking and partnerships with local farmers, processors, distributors and customers, the Robie Farm products are sold to many major restaurants and distributed through numerous retailers in the New Hampshire / Vermont area as well as being sold here on the farm at the Farm Store. Betty Sue, along with all the homemaking responsibilities, looks after her precious grandchildren and still finds time to be active on the farm and in the store. Mark’s knowledge of both the dairy and cheese operations and his commitment to producing the finest quality cheeses, meats and milk are at the heart of the farm's dedication to make truly exceptional products. Mark, along with Johathan the Farm Manager, oversees the entire farm operation. It is his job to ensure that the milk, cheese, and meats that are sold at the farm store and to our wholesale clients are of the highest quality. Mark’s past experience working in various restaurants has given him the understanding to know what chefs are looking for in both the cuts and quality of the meat they buy. This inside knowledge is an asset to Mark when he is on the road as a salesman for the farm products. Mark is committed to seeking out new restaurants and retailers as well as being faithful to keep current customers happy. ​The years Mark spent in Mission work has proven to be an asset not only in his personal life but in his ability to work with people from all walks of life. Mark lives and works on the farm with his wife, Elaina, and their two beautiful children. Jonathan may not be family by name, but he is endeared to us as one of our own. Jonathan comes to us from Texas where his experience in business operations and land management, as well as his experience in his own pastured poultry business, have enabled him to become a valuable contributor to expanding our enterprises at Robie Farm. ​His responsibilities at the farm are the management of general daily operations ranging from breeding and herd management to repairing equipment and mending fences.